St. Louis, MO (March 27, 2018) – In just over three weeks, Circus Flora unveils its brand-new show under the Big Top in Grand Center. Audiences will be immersed in The Case of the Missing Bellhop, an intriguing whodunit with a cast of characters ranging from a determined detective to a troupe of trained pigs. 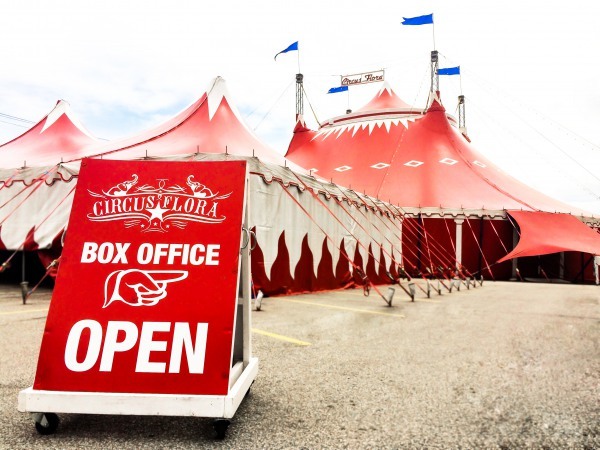 Taking advantage of the cooler Spring weather, the Circus Flora season is now April 19 to May 13, with Opening Night festivities taking place on Saturday, April 21 (World Circus Day). Tickets start at just $12, and Circus Flora offers a variety of special engagements, including a Sensory-Friendly Performance (May 2 at 7 p.m.), a Peanut-Free Preview (April 19 at 7 p.m.), and one-hour Little Top Performances (April 27, May 4, and May 11 at 10 a.m.). The Case of the Missing Bellhop whisks audience members away to the world-famous Balding Hotel, where extreme luxury and dark mystery collide. The show features such new-for-2018 acts as the Wheel of Destiny, which acrobat Jeison Dominguez scales effortlessly as it spins high into the apex of the Big Top, plus returning fan favorites (including The Flying Wallendas, the Alanian Riders, and Circus Harmony’s St. Louis Arches). Other amazing acts include Roxane Gilliand on the Swinging Trapeze, the international acrobat trio “Swing Up” and their trampowall, and (of course) Cuzin Grumpy’s trained pigs. To purchase tickets (starting at just $12!) and for more information, visit www.circusflora.org.